As with the 30' Ernest Shackelton, the 33' Freyja, the 44' Valhalla, the 55' Valkyrie, and the 66' Asgard designs, inspiration for this vessel was drawn from Viking craft, as well as from Coast Guard surf boats and Whaleboats, all of which were double ended in their original form for maximum seaworthiness. One whaleboat in particular, the James Caird was purpose-built for Ernest Shackelton to take along on the Antarctic voyage on which his ship Endurance was crushed by the ice. The whaleboat allowed Shackelton to sail from Elephant Island at the north end of the Antarctic Peninsula where his crew were marooned, to South Georgia Island where a whaling camp was known to exist, more than 800 miles distant. Shackelton's voyage in the whaleboat James Caird was one of the greatest sea voyages of all time. The 78' ODIN design shown here at 78 feet on deck (23.8 m) is much larger than the James Caird. But in keeping with the smaller 30' Ernest Shackelton design, a simple structure is used so that the vessel can be built economically. The goal has been to create an easy to build, affordable, easy to sail and easy to inhabit boat, but at the same time one that can be used in extreme seas in order to allow worldwide cruising in complete safety. Being a double ended boat there is perfect balance when heeled. In other words, unlike a transom stern boat on which the heeled centerline shifts to leeward at the stern, with a double ended boat the centerline stays on center when heeled. On a transom stern boat, when rolling the shift of the CL astern (but not at the bow) induces yaw, which results in difficult steering control. By contrast, the inherent balance provided by a double ended hull shape does not induce any added yaw, therefore providing greater steering stability, and much less weather helm under sail. Having a flush deck at each end provides the ultimate in seaworthiness. This is the same configuration used by the original Coast Guard life boats which were intended for rescue work in extreme conditions. The raised fore and aft decks provide the maximum reserve buoyancy in the ends, and add considerably to the righting moment in a knockdown. The cockpit being just aft of amidships offers the maximum protection from boarding seas. In all, the 78' ODIN is reminiscent of Herreshoff's 55' MARCO POLO. Though by comparison the Herreshoff design is much smaller and extremely narrow (only 10 feet!!). In contrast the MARCO POLO is much deeper - a necessary consequence of having such narrow beam in order to carry her sail. Despite those differences, Herreshoff rightly selected the double ended hull form and "whale back" flush decks at each end for his own "most seaworthy" pelagic yacht design. The all aluminum structure planned for the 78' ODIN provides an extremely rugged hull as well as light weight, allowing the structure to be fully welded and completely water tight. At 78 feet on deck, headroom is able to be a full seven feet throughout. The keel is fairly low aspect, allowing safety when grounding - intentionally or otherwise - and expanding the cruising grounds considerably. It is not necessary to have a centerboard, however it would be quite possible to arrange for one, or to have tandem centerboards for the ultimate in balance. 5.7' Draft ( 1.73 m) allowing easy navigation anywhere outside the one fathom line. Target displacement is approximately 106,000 pounds light ( 48 m.t.) and 123,000 pounds loaded (56 m.t.). The Displacement to Length Ratio is 123 at the Reference WL, indicating an extremely light and easily driven hull. Sail area is planned to be 2,800 square feet (260 sq. m.). Light weather sails could be provided, although they are hardly necessary given that the Sail Area to Displacement Ratio of 20, and SA to Wetted Surface Ratio of 2.2. Typical displacement hull speed is considered to be 11.5 knots for a vessel of this size purely as a function of the WL length, however due to the extremely light 123 D/L Ratio the 78' ODIN is expected to easily reach 16 knots under sail. Believe me, 50-some tons of boat blasting along at 16 knots under sail definitely *is* something to write home about...!! The framing is arranged in modules of 56 inches, which conveniently allows for flexibility with the interior layout. There are four aluminum bulkheads, one at each end of the center cockpit, enclosing the engine room below, and one at each end to enclose the forepeak and the lazarette / after peak. With four bulkheads and only eight frames, construction is made as simple as possible. 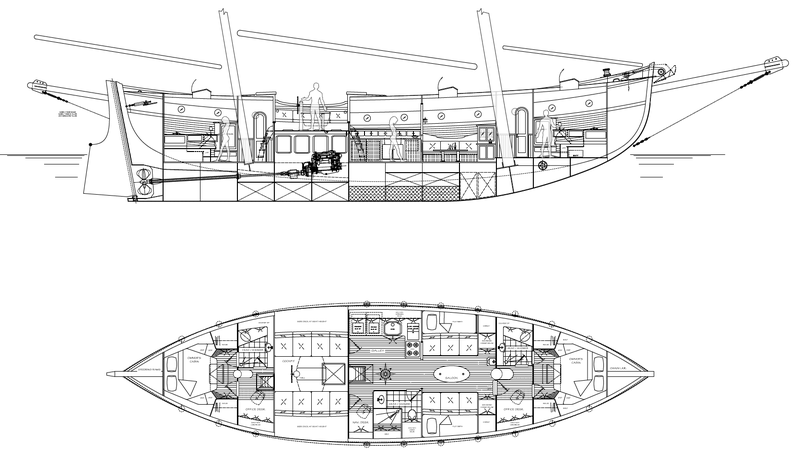 The interior has been planned to allow two couples to live onboard in comfort, with their cabins as equal as possible. In addition, there are sleeping spaces for six guests using the two saloon pilot berths, the saloon settees, and the cockpit seats - in other words, sleeping for ten in all. Now, no one in their right mind would want to have that many onboard for more than a weekend camping adventure, but there is space for it..! Following the drawing above, we observe two sleeping cabins, one located in each end. The two private suites are nearly identical at 14 feet in length for each. They include a head / shower compartment and writing desk / office / computer station. Just forward of the cockpit, the galley is located to port and spans a length of 9' - 4" arranged in an "L" shape. To starb'd of the galley there is a guest head forward, and a navigation station aft just forward of the cockpit bulkhead. This is probably the best use of the space to starb'd of the galley, especially on extended trips with guests in the pilot berths - thus providing comfortable accommodation for six on an extended voyage, with permanent accommodation for four to live aboard. At 9' - 4" in length, this space could also be used as a guest or kid's cabin, providing private accommodation for another couple or bunks for a couple of kids. Alternately it could become an office / project room. Actually it could be both... i.e. an office that can be converted into a guest cabin...! Just forward of the galley / guest head is the saloon, also 9' - 4" in length. The concept here is to have a settee / couch on each side, with a low coffee table in between. Outboard of the settees are a pair of fully enclosed pilot berths. Just forward of the pilot berths / settees are a pair of side-board cabinets, with cupboards above and outboard - perfect for glassware or possibly a wet bar to starb'd. The amidships cockpit is 9' - 4" in length. Arranged with a long settee / berth on each side, there is ample seating for everyone onboard. With a table on center that can be extended, it makes a good outdoor entertainment / dining area. It is also a functional cockpit, having a binnacle and wheel steering, with easy access to sheets and halyards. A canvas awning over the center cockpit area would be easy to arrange in order to provide shelter from rain and sun. Alternately, a hard dodger could be arranged for better shelter from the elements. Below the cockpit seats on each side are a pair of rather enormous storage lockers for deck gear, fenders, spare line, dock lines, and the like. Outboard of the seat-backs is a side deck - a convenient place to step aboard, and a good place to keep sheets and other lines from invading the cockpit itself. Below the cockpit is a large engine room, having fuel tanks outboard and a bench seat along each side just inboard of the tank face. This makes engine maintenance easy from a seated position on both sides. The cockpit sole structure extends out to the side of the hull, and the large integral tanks are located below that continuous deck. Thus, the tanks extend from the cockpit sole to the hull bottom the full length between bulkheads outboard. The engine is planned to be a 6 cylinder John Deere 6068 TFM marine diesel with a standard reversing marine gear driving a Nogva pitch control Servo. A three blade Controllable Pitch Propeller is specified, allowing full feathering during sailing. 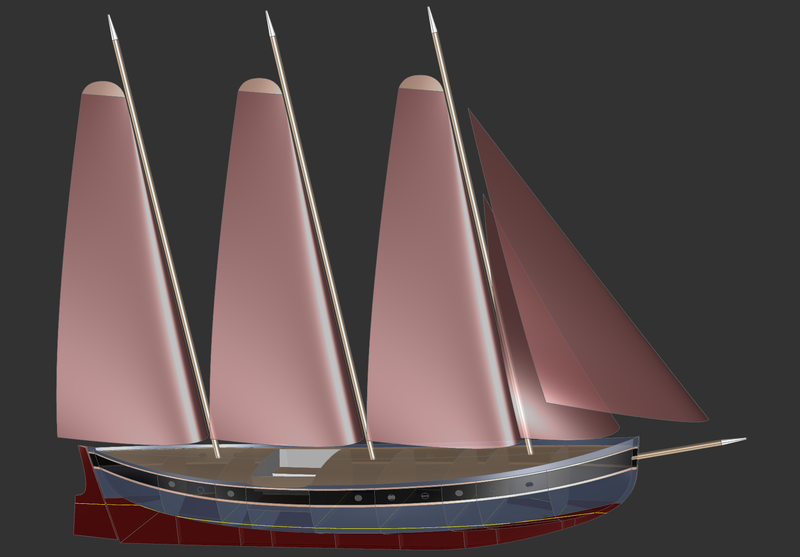 A simple Bahamian Tern Schooner rig is shown. The spars are aluminum Schedule 40 pipe, which is considerably stronger than wood, and it does not rot! Pipe has sufficient wall thickness to allow the fittings to be fully welded in place. This whole affair is very easy to build and there is far less maintenance than would be required for a wooden mast. The objective in general is to have the rig be as simple as possible, to have low stress in all components, and to have most of the sails be self-tending so there is no drama in tacking. The Bermuda rig as shown lends itself rather well to use of wishbone booms, which serve to keep the sails perfectly trimmed regardless of their angle to the wind. A wishbone is also conducive to the use of roller furling along the luff of both main and mizzen. The 78' ODIN is planned around being the maximum size vessel that can still be considered under the EU Recreational Craft Directive, i.e. under 24 meters LOA. The ISO STIX score is therefore applicable. The minimum score for all ocean travel is 32. ODIN scores an extremely impressive 78..! All IMO criteria are met with a generous margin. 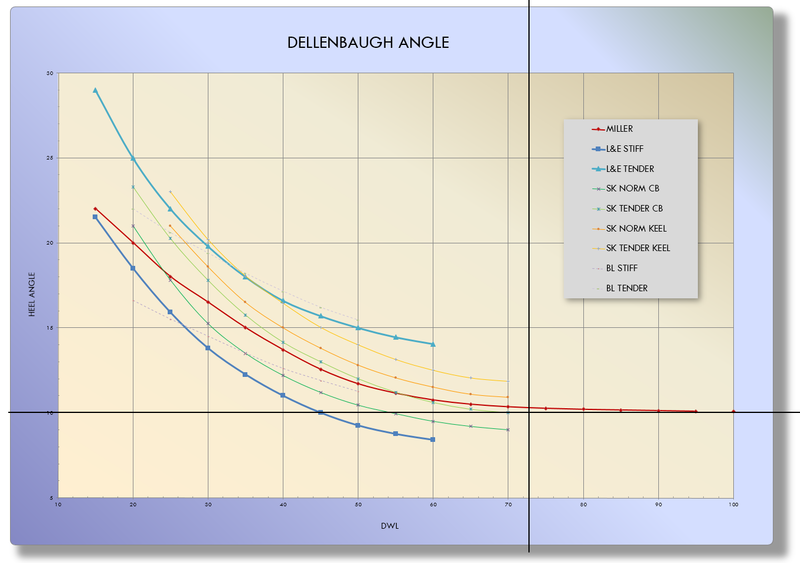 The MCA Large Yacht stability criteria are also met by a wide margin, and the usual 'Squall Curves' show a highly remarkable 43.5 degree safe sailing angle (the intersection of the green heel arm curve with the blue GZ curve)...! The blue curve is the righting arm curve (GZ curve), which reveals a range of positive stability to 142 degrees of heel, and minimal negative area, indicating that in any sea sufficient to cause a roll-over event, the vessel would slosh back upright rather quickly. 78' ODIN Dellenbaugh Angle - Click for Larger Image. This graph shows the approximate amount of heel to be expected in 15 knots of wind with all sail sheeted flat. Several opinions as to what is appropriate are plotted from a variety of sources. Henry & Miller seem to have struck the middle ground (red curve). With a WL length of just under 73 feet, the ODIN 78 comes in at 10 degrees of heel, which is slightly more stiff than would be expected of a vessel this size (the red line curve is the norm). This is remarkable considering the sail area, and the very shallow draft. It illustrates the benefit of keeping the aspect ratio of the rig within appropriate limits for ocean voyaging. In other words, unlike the extremely narrow MARCO POLO, the ODIN 78 will not sail on her ear...! Having been originally modeled after the very capable Viking craft somewhat in the vein of Shackelton's whaleboat, we have the makings of a truly pelagic vessel - one that perfectly illustrates my ideal Nomadic Watercraft.